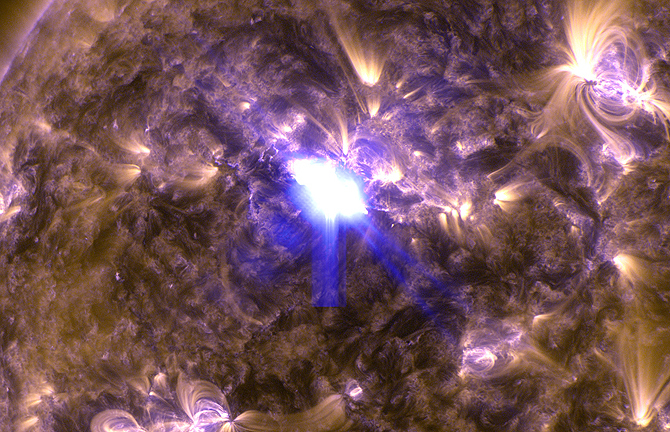 UV image of the April 11 M6.5 solar flare captured by the Solar Dynamics Observatory (Credits: NASA). 2013 was supposed to be the year of solar maximum, generally accompanied by a very active solar surface. Instead, the year has been on the quiet side, causing some scientists to even question whether we’re experiencing a maximum at all. But on April 11, the Sun finally woke up and showed its spots. In the early morning hours, an M6.5 solar flare sent out a burst of radiation that caused a moderate radio blackout swiftly followed by a moderate radiation storm; the storm is ongoing but has since been downgraded to a more minor S1 category. A coronal mass ejection (CME) also blew out of the flare site, sunspot area AR1719. According to recordings from the Solar and Heliospheric Observatory (SOHO), the CME will blow past Earth on April 13, producing polar aurorae and possibly a geomagnetic storm. Geomagnetic storms can interfere with electronics both on orbit and on the ground; more mild storms simply produce multicolored aurorae at the poles where the solar radiation interacts with Earth’s protective magnetosphere. The M65 flare is the strongest yet in 2013. A more mild C-class solar flare closed out the day; it produced no significant effects on Earth. SOHO captured this view of the April 11 coronal mass ejection passing in front of Mars and Venus and speckling its coronograph with energetic solar protons (Credits: NASA/SpaceWeather.com).